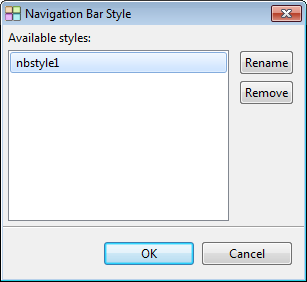 This section will show how to use the styles of an existing navigation bar for the new navigation bar. This this useful especially when creating secondary navigation bars. Each with different item text and links but share the same styles. Select Insert -> Navigation Bar. The Navigation Bar Templates Dialog will popup. Click the button Cancel to close it. Click on the "Style tab". Then click on the button "Use Style From Another Navbar". Select one of the navigation bar style from the available styles that are used by other navigation bars on this website. For this example, we will select "nbstyle1". Click OK to apply this style to the navigation bar. Click OK again to add this navigation bar to the current page.